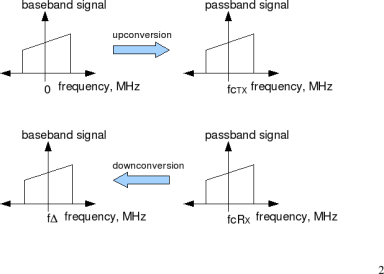 In this post, let us evaluate the impact of frequency offset resulting in Inter Carrier Interference (ICI) while receiving an OFDM modulated symbol. We will first discuss the OFDM transmission and reception, the effect of frequency offset and later we will define the loss of orthogonality and resulting signal to noise ratio (SNR) loss due to the presence of frequency offset. The analysis is accompanied by Matlab/Octave simulation scripts. In an OFDM receiver, we will multiply the received signal with a bank of correlators and integrate over the period . The correlator to extract information send on subcarrier is . takes values from till . In a typical wireless communication system, the signal to be transmitted is upconverted to a carrier frequency prior to transmission. The receiver is expected to tune to the same carrier frequency for down-converting the signal to baseband, prior to demodulation. Let us assume that the frequency offset is a fraction of subcarrier spacing i.e. The integral reduces to the OFDM receiver with no impairments case. distortion due to frequency offset between actual frequency and the desired frequency . 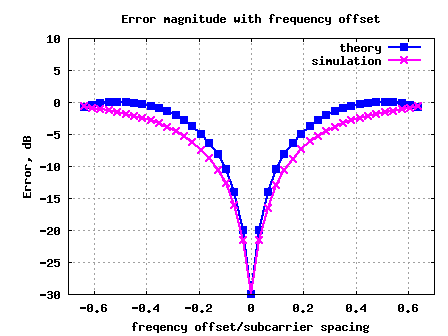 distortion due to interference with other subcarriers with with desired frequency . This term is also known as Inter Carrier Interference (ICI). 1. 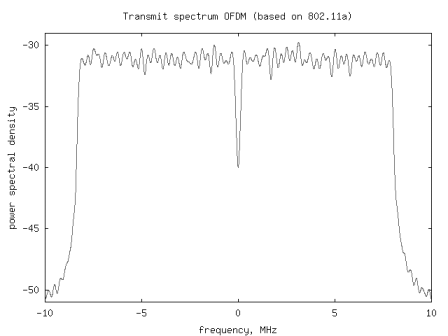 Generates an OFDM symbol with all subcarriers modulated with . 2. Introduce frequency offset and add noise to result in =30dB. 3. Perform demodulation at the receiver. 4. Find the difference between the desired and actual constellation. 5. Compute the rms value of error across all subcarriers. 6. Repeat this for different values of frequency offset. The theoretical results are computed by . Quite likely the simulated results are slightly better than theoretical results because the simulated results are computed using average error for all subcarriers (and the subcarriers at the edge undergo lower distortion). hidden morkov model and selected applications in speech recognition in mat lab implementation . in which i didn,t get an idea that can restructure the model by using matlab code.please can you help me to proceed to write a code in mat lab.and can u help me to modification in the existing hidden model in speech recognition so that we will get benefit . i am doing my PG project in ofdm communication…..can u plz give me the matlab code for ICI SELF CANCELLATION SCHEME IN OFDM SYSTEM according to IEEE 802.11a standard….or suggest some reference material…which will help me…..
@kareem: Are you getting zero BER in no noise case? How are the bits getting converted to modulation symbols? where a is a vector of N complex variables. i am experiencing problem in reshape. if you can rectify then i will be highly oblige. Krishna, thanks for the quick reply. I dont get your question on linearly varying phase? But the constellation always has 45 or 135 or 225 or 315 degree of phase shift, so it has about 90 degree difference between them. Anyway symbol timing synch has a lot of method, which method can I look into, do you have any code referring to timing synch? For receiver portion, im using correlator receiver, not PLL cause I feel its pointless cause correlator works extremely well for my back-to-back. @Thavamaran: Not sure why you are seeing a fixed phase shift. Kinda surprising. @eng_dina: Sorry, I do not have the matlab codes. Hi Krishna, this is my first post in your website. This is a very straight forward example. I have built my OFDM system and my back-to-back works perfectly fine. But when I perform optical OFDM, which is part of my work, at the receiver, the constellation point shifted by 45 degree, then I just compensate the phase, but end up I realize that its nonlinear phase shift. But I dont think I have a problem with CFO, cause its ideal. Do you think I need timing symbol synchronization? Please advise. Thanks. @Thavamaran: Are you having a linearly varying phase across subcarriers? If yes, it might be related to the symbol timing synchronization. Thank you for replying, I will see the post then I will back to discuss you. The simulated curve was around 50% and increased slightly as EbNo increases. 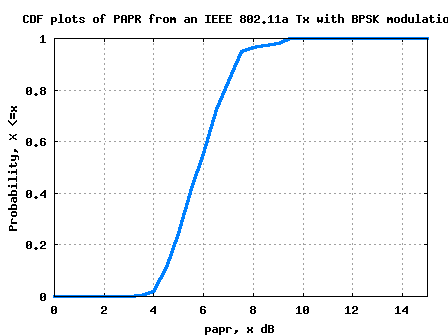 Is it necessary to compensate for frequency offset before demodulating the bpsk symbols as in Rayleigh fading channel?????????? @Shaimaa: If there is frequency error, then the intercarrier interference can result in poor BER. However, I have not done the simulations to see how much bad it can get. what are the problems are occur in high PAPR? I hope you are doing fine and great. I have seen your code and its great. here you have supposed that all the input symbols are modulated like ak=1, if I am right for this reason you are generating all ones as the input i.e. @invizible: Oh, is it. I have not tried that. %f_ndopp = f_max*M_sub*T_s % Normalized Maximum Doppler Spread Freq. Can you please provide any references (books or web links) for SNR loss calculations (analytical) for AWGN and dispersive channels. I want to find BER for 4QAM in OFDM using AWGN. If i take the difference between reciver’s demodulated symbols and actual symbols(at transmitter) and devide the difference by the length of actual symbols, can i get the BER? i gone through above code.it is useful to understand ici. but i have queery that how to cancel ici due to phase offset due to local oscillator frequency offset. @r.kalidoss: Delay spread is computed using the amplitude of the taps and their delay values. Hi there…for one more question..
if i change “ones” to “rand”, the result seems to have differences. Can you explain it? With ak’s randomly distributed, the interference term slightly changes. How much difference did you see? 1.I would like to know that why we need to have 1e3 in the following expression. 2.As you mentioned about,choosing -5 to 5 as subcarriers outside that range has negligible interference.I still have a bit of confuse about it.Can i change to others values? I’m a bit confused about the theorical results calculation..
could someone explain to me please how ([-5:5]+delta) relates to (k-m+delta)? Well I of course get the delta part just not sure how -5:5 was chosen? @Treasa: I just chose -5 to 5 as subcarriers outside that range has negligible interference. why the subcarriers at the edge undergo lower distortion ??? @Obaid: Well, at the edge there will be subcarriers only at the left or right and not both. Hence there will be lower interference. i am working on Next generation WLAN 802.11n Simulation. i would like get the simulation for MIMO OFDM with MMSE equalizer .and also with MIMO OFDM STBC codes. pls help me .i would greatful if you help me. Can i think, due to change of frequency i.e. m/T to m+q/T (Frequency offset) orthogonality of the signal change? @kalidoss: Yes, you are right. Krishna, Can we think frequency offset is due to doppler shift…..apart from carrier mismatch in the receiver…. @kalidoss: I have not discussed Doppler in this post. I guess the effect of Doppler might not be as simple to understand as is the case with frequency offset. I will write about Doppler soon. 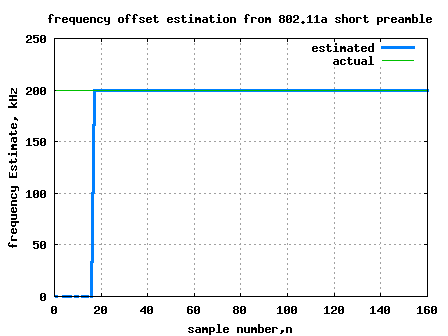 First time i saw the frequency offset problem in OFDM with simple example.Its fine working. Then to how to mitigate this problem. Any method available to solve this issue. exp(1i*2*pi*freqOffsetkHz_v(ii)*1e3*t), and you are simply shifting the spectrum by multiplying the two time-domain signals. Sorry, I didn’t know what I was thinking. @Urbie: No problem. Glad that you have solved it. Next post: Matlab or C for Viterbi Decoder?